The LiteMap toolbar lets you enter data into LiteMap while browsing the web. If you are using Firefox, Chrome or Safari you can drag the above link to your browser Favourites toolbar. If you are using Opera, right-click on the link above, select 'Bookmark Link...'. You can then choose to 'Show on bookmarks bar'. Only available for IE 9+: drag the above link to your browser Favourites toolbar but you will get a security warning message. Just select OK.
1. In Internet Explorer, select Tools > Internet Options. 3. 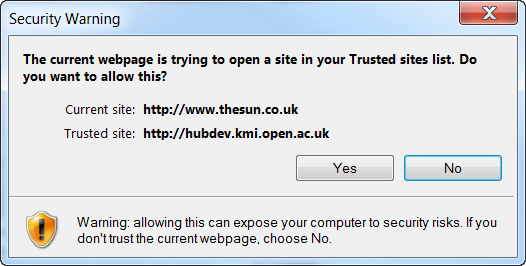 Select "Trusted Sites" (the big green tick). 4. Click the "Custom level..." button. 5. In the "Security Settings" dialog, scroll down to the "Miscellaneous" section. 6. Find this setting: "Websites in less privileged content zone can navigate into this zone" and select "Enable." 7. Click OK to close the dialog, then OK to close Internet Options. NOTE: Due to changes in security policies on browsers it is now possible for websites to block bookmarklets like ours that load content from a another website from working on their web pages. Facebook and Twitter are two examples of sites that have implemented this policy. On these sites, clicking our bookmarklet shortcut will currently do nothing, so it may appear broken, but it is just blocked. This bookmarklet will still work on the majority of websites as they have not implemented this new security policy. Your browser may also block the bookmarklet, so you may have to override your browser setting to get it to work. We are currently writing new browser specific extentions to help with this issue (see below). Due to circumstances beyond our crontrol our Browser specific plugins no longer work. We will be looking to replace these in the future.